Wherever Lord Krishna is there Lord Shiva also dwells and wherever Mahadev Shambhu is there Sri Hari also dwells. The loving tie between Sri Krishna and Sri Shiva proves the Lord's words that "My devotees are always absorbed in thinking about me and I am always absorbed in thinking about them." In the Brihad Bhagawatamrita, Lord Brahma says to Devrishi Narada, "O Narada, I have never seen anyone more dear to the Lord than Shiva. Shivaji is constantly absorbed in the nectarean mellows emenating from Lord Krishna. nirantara kahe shiva "murli krishna dasa"
Lord Shiva is the embodiment of supreme detachment. He smears his naked body with ashes and wears a garland of bones. A deadly cobra encircles his neck and his matted hair flails wildly as he dances his tandava nritya with joyful abandon. 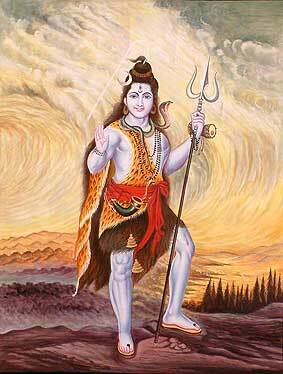 Lord Shiva carries the sacred Ganga, which emenates from the toe of Lord Vishnu, on his head in his thickly matted hair. Lord Shiva is universally worshipped as the greatest devotee of Sri Krishna, Vaishnavaanaam yatha shumbuh (Srimad Bhagawatam 12.13.16). When Lord Krishna appeared in Gokula, Lord Shiva could not contain himself. Dressed as a sadhu, He went to Gokula and stood at the door of Nanda Baba's house asking to see the new-born. Both mother Yasoda and Rohini eyed the wild looking sadhu suspiciously and felt that his appearance would frighten the little baby. They refused to let Him see the boy. Lord Shiva tried in many ways to get them to change their mind and when they didn't allow him He was crushed. Lord Krishna knew that His devotee, His dear Sadashiv was eager to have His darshan. So right at that moment, He started crying very fiercely and loudly. Yasoda mata tried her best to pacify Him, but to no avail. Then finally, thinking that the sadhu baba might atleast distract the child, she brought Him to the courtyard and let Lord Shiva see the divine child. Both Bhakta and Bhagwan were happy to have darshan of each other and immediately baby Krishna stopped crying. 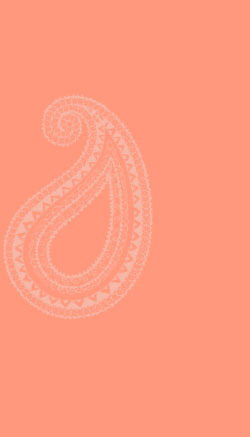 Lord Shiva is usually an integral part of Lord Krishna's leelas. Easily pleased and hence called Ashutosh, Lord Shiva generally ends up giving some belligerent rakshasa a boon that causes Lord Krishna to appear. But Lord Shiva is very clever. He appears to give a boon, but it is actually a punishment. Lord Shiva has two types of mercy, sakapat kripa (mercy with cheating) and nishkapat kripa (mercy without duplicity). To the danavas and rakshasas who always pray for power, strength, invincibility, weapons and material opulance, He gives sakapat kripa. When He granted the wishes of danavas like Ravana and Vrikaasura, Lord Mahadeva gave sakapat kripa. Those who are innimical to Lord Vishnu but worship Lord Shiva, always get the Lord's sakapat kripa. Similarly, those Vaishnavas who ignore Lord Shiva's pre-eminent position and worship Lord Vishnu, are deluded all to easily by the Lord's maya. In Brihad Bhagavatamrita, Lord Brahma says to Narada Rishi "One should not differentiate between Lord Shiva and Lord Vishnu or Krishna. Krishna may forgive one who commits offences at His own lotus feet. But He never forgives one who commits offences at the lotus feet of Lord Shiva. Shiva is Vaishnava agraganya, the greatest Vaishnava. To devotees of Lord Hari, He awards nishkapat kripa. Every devotee of Lord Krishna has to pass the quality test of Lord Shiva before Lord Krishna accepts them. A visit to the Braja Mandala region needs Lord Shiva’s permission. In Mathura Lord Shiva's temples surround the town in all the four corners. There are 4 Shiva lingas located in the four corners to protect the city. These lingas are called the dik-pala of Mathura. These lingas are called Gokarnesvara Mahadeva in the north, Pippalesvara Mahadeva in the east, Rangesvara Mahadeva in the south and Bhutesvara Mahadeva in the west. Indeed the whole of Braja mandala abounds in temples of Lord Shiva; Chakleshwar Mahadeva near Govardhan, Nandishwar Mahadeva in Nandgaon, Gopeshwar Mahadev and Bankhandi Mahadev in Vrindavan, Kundeshwar Mahadev in Radha Kund, Kedareshwar Mahadev, the Kedarnath temple located in a remote corner in the Braj mandala parikrama marg, Kameshwar Mahadev and many others. Because I constantly chant His name and qualities, death does not touch me. Death runs away from that person who chants his name. By reciting His name and qualities while performing my austerities for a long time, I have achieved the power to destroy all the universes and have conquered even death. Sadhakas in the raganuga marg pray to Lord Gopeshwar Mahadeva to bless them with gopi rupa and gopi bhava and permit them to enter into the Lord's maharaas.